It's time for SOOC (straight out of camera) Saturday at Slurping Life. This week I have some pictures of family game night. This game (Rivers, Roads and Rails) is one of my favorites . . . everyone else tolerates it because I like it so much! I think my favorite shot is the second one. I love your boy on the table! Our little girl is just getting into games, so we've been having lots of game time, but not a dedicated game night. We'll have to start that soon! I love family game night except we are so competitive, and it can get quite ridiculously fun! Sorry is my all time favorite game, I could "force" everyone to play it over and over and over again. Our cards are so worn it's almost time for a new one. I love your son on the table it kind of shows how into the game he is. FUN! FUN! FUN! I love the little one sitting on the table (because I frequently ignore chairs too) - and I love how they were getting into it! What treasures these photos are! That looks like fun. I love family game night! 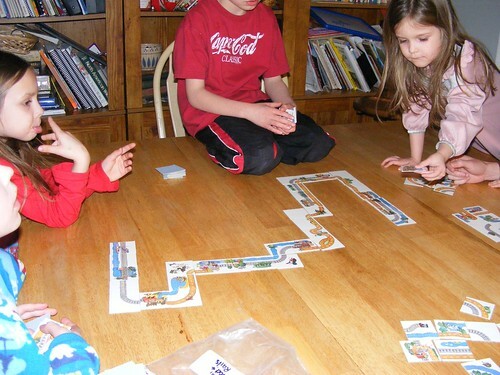 I miss game night when my kids were younger. Looks like everyone was having a good time. everyone loves game nights...i always seemed to have a hard time keeping the baby from swiping everything...and by the time he/she was put to bed the games were over...oh well i tried i guess. 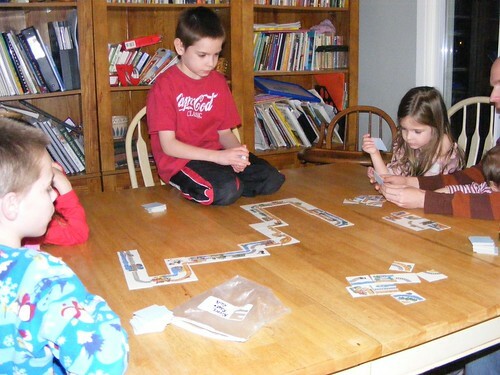 now my kids play cards and monopoly all day with each other. Looks to me as though they are enjoying the game rather than just tolerating it for you. I'm with the group...love your guy on the table.